You are here: Home / Blog Post / The (free, online) Fundraising Summit is this week! Don’t miss it. Here’s a wonderful resource for fundraisers. It’s a LOT of free education on a variety of fundraising topics. I know several of these speakers and they are good. My topic is highlighted below. The Summit is a free online event taking place this week. If you’re short on time, register now. Join an expected audience of 80,000 of your peers from around the world for five days of insight, instruction and inspiration from 40 of the world’s best speakers. Learn new ways to tackle your most pressing problems. Learn best practices from the best in national and international fundraising. Sessions are free, but only for 24 hours! Registration is free. Register today. You don’t have to fly half-way across the world to hear the best speakers on fundraising. 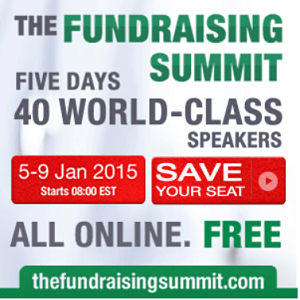 They will be online THIS WEEK (Jan. 5 to 9, 2015) at The Fundraising Summit. Here are a few of the 40 amazing presenters you’ll hear. Register now for this free summit. I wish there was a way to access your free workshops on line. Being very new to this I am lost. Love the ideas of asking for boating trips, but can’t find where to find a company. The classes on this are months or years old. Pam, did you see that I’ve got a “free resources” tab on my website? Though you won’t see paid content there, someone new to auctions (and some folks NOT so new to auctions) would learn a lot just by watching and listening to the resources I have there. There are also over 500 blog posts that have gems, if one takes the time to read through them. The most direct way to learn is via my DVDs and classes; those require an investment as they offer complete systems, templates, resources, etc. Those give complete in-depth understanding of the chosen topic. Many topics (sponsorship, live auctions, silent auctions, raffles, games, registration / checkout, and so forth) are on this page, and for procurement specifically, you might want to be alerted for when my class Big Ticket Procurement Secrets is next announced. Without knowing anything about your situation, the DVD I’d recommend is Easy First Auctions. It is also taught under the name “How to run an auction on a shoestring budget” when it’s offered through CharityHowTo. Good luck!